Harvest festival meets Random Recipes meets Clandestine Cake Club in this post. As we had a hard challenge for August, Dom has gone easy on us this month and it’s back to the basics of picking a random book from our collection and then a random recipe from that book. 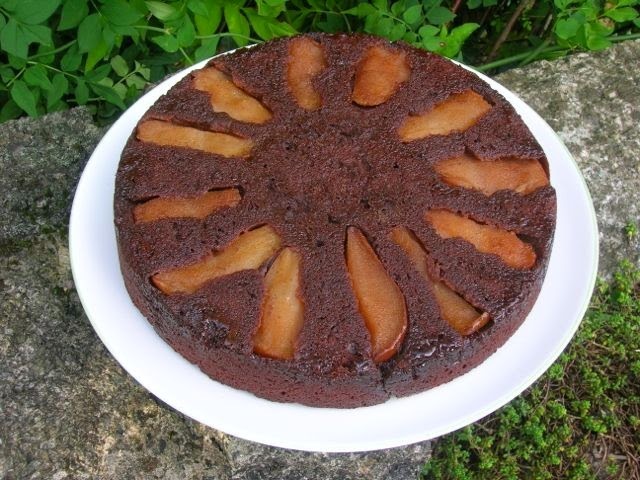 I used my usual Eat Your Books method of selection and came up with a recipe for a simple chocolate pear upside-down cake in Jennifer Donovan’s book Chocolate. Happily this pick coincided with a Cornwall Clandestine Cake Club gathering on Thursday where the theme was harvest festival. And to tie it all together in a nice little bundle, my mother turned up with a jar of pears that she’d just poached. All sorted. I had to add my own twist of course, so apart from using poached pears rather than raw ones, I substituted the vanilla for cardamom. The cake was fudgy and chocolatey, but the cardamom and pear stopped it being too sweet and sickly. It was in fact a delicious cake I will be repeating and the good folk at cake club seemed to enjoy it. Melted 200g butter with 200g of dark 70% chocolate in a large saucepan over low heat. Stirred in 150g cardamom sugar (golden caster sugar) and left to cool a little. Beat in three duck eggs (large hens eggs will be fine) with 1 drop of the excellent Holy Lama cardamom extract (or the ground seeds from 1-2 cardamom pods, depending on how subtle you want the flavour). Sifted in 120g self-raising flour and stirred gently until just combined. Sprinkled 3 tbsp of dark brown sugar over the base of a 9″ round silicon mould. Lay 12 pear quarters on top of the sugar then poured the batter over the top. Baked at 180℃ for 30 minutes until just done. Left to cool for about ten minutes, then turned the cake upside down onto a serving plate. The harvest festival theme resulted in a bounty of fruit and vegetable cakes. The cake shown here completely stole the show, but they were all very tasty and yes, I did manage to try a piece of each! An independent wine merchant with accompanying champagne and coffee bar, Bin Two in Padstow, was our venue and some of the participants seemed much more interested in the wine than they did in the cake. The shop included a cafe bar, so we all crowded and got up close and cosy. Thanks as always to Ellie Mitchell for organising another splendid cakey gathering. Bin Two were hosting a Macmillan Coffee Morning the following day, so I also brought along a few oaty ginger biscuits. These were quite fiery as they were not only flavoured with ground ginger but included crystallised ginger too. CT got almost grumpy when he was only allowed to try one. So this is another success I put down to Dom and his Random Recipes over at Belleau Kitchen – such a fun and interesting challenge – most of the time anyway! I had a bit of a dilemma trying to decide which of this month’s seasonal recipes should be sent to Simple and in Season – there have been so many good ones. But despite the rather prosaic nature of pear after the colours and flavours of blackberry and plum, this cake deserves recognition. Nazima of Franglais Kitchen is hosting this month on behalf of Ren Behan. Love the idea of pears with chooclate and cardamom, sounds divine. Poor CT, the life of a food blogger’s other half is a bit ‘trick or treat’! MMmmm that looks so good. Chocolate, pear and cardomom is a delicious combo. I have been thinking to bake something with pears..and chocolate pear and cardamom sound like a beautiful combination. The cake looks super Choclette. Fab mix of flavours Choclette. Chocolate and Pear is such a wonderful combination….. The addition of cardamom sounds perfectly exotic! Chocolate and pear is one of my favourite combinations; love the sound of your fiery oaty biscuits too! I love the combination of ingredients and flavours. mmm pears and cardamom and chocolate. What more could you ask? I do love the combination of chocolate and fruit … these pear slices peeking out of that layer of chocolate crumb are extremely tempting! PS Thanks for your kind words Ms Choclette! I love pear bakes, they’re always so moist and super sweet! Perfect autumn cake! What a brilliant combination of flavours and I too love baked pears. They just make a cake a little bit more special. I am a slave to cardamom chocolate and pear so when they are all in one cake I am positively addicted. gorgeous cake – thought I had commented but must have fogotten to submit. This looks so pretty and cardamom and pear are a perfect combination. I am addicted to cardamom after travelling some Nordic countries over the winter, I’m putting it in everything! This looks like a great combination. Thanks Rachel. I have a jar of cardamom sugar permanently on the go. Firstly I want to say what a wonderful blog you have, it’s full of insight not only about the food but it shows a lot of your personality and and gentle/kind demeanour which I find refreshing. I love this recipe. It truly sounds quite divine and decadent and your picture does nothing to stop you from thinking otherwise 🙂 I love the fact you adapted on the go to include the pears for the cake. I love being spontaneous with ingredients too so it’s nice to see you mention that in the post. Well done too Choclette for your contribution to the Macmillan coffee morning at Bin 2. Its great to know there are fellow contributors out there doing good for those in need wherever they may be. Gosh, thank you very much Lee and how lovely of you to say what you have. I tend to go my own way when it comes to recipes, which may not always be the best policy, but mostly has good results. Do let me know if you make the cake and how you get on with it. I adore cardamom in cakes. It’s just getting the level right that can be a bit tricky, noticeable without being overpowering. Ah glad you made it, but a shame you didn’t have any pears to go in it. Mine happened to be poached, but raw or tinned pears should have been fine. I’ve just updated the cardamom bit as I should have said how many pods were needed. I’d have only put the seeds from one or two in as I like it to be a hint rather than very pronounced. But it’s what’s right for you that counts. I really like Indian sweets and have a recipe on here somewhere for blackberry barfi.